Beset by hard-to-keep promises and a massive website failure, President Barack Obama traveled to the heart of the "Obamacare" opposition Wednesday to give a pep talk to the law's supporters. 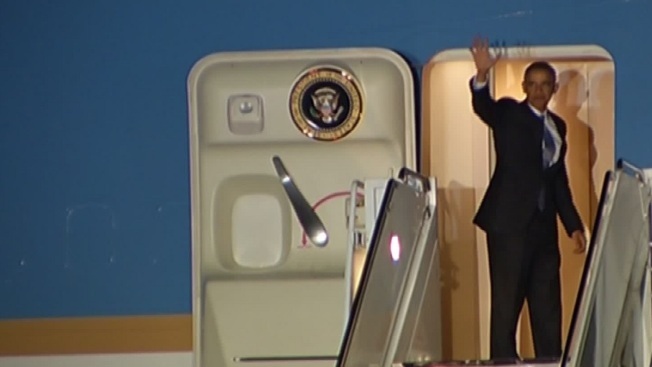 The president touched down at Dallas Love Field late Wednesday afternoon ahead of his talk at a local synagogue to push participation in the Affordable Care Act. Obama spoke at Temple Emanu-El to about 75 volunteers from the Dallas Area Interfaith Coalition. He said he was the first to admit he was unhappy with the rocky first month since new insurance exchanges went live. He implored volunteers to continue helping consumers to stick with it, casting it as an effort that would, eventually, be well worth the trouble. "As challenging as this may seem sometimes, as frustrating as Healthcare.gov may be sometimes, we are going to get his done," Obama said. "And when we do -- when we do, not if -- when we do, you're going to have families all across this great state of Texas who are going to have the security and the well-being of high-quality, affordable health insurance," he added. During his speech, Obama mentioned how badly many Texans were in need of affordable health care because the state is home to the highest rate of uninsured Americans. He also addressed the struggling HealthCare.gov website. "Nothing drives me more crazy than knowing that good insurance plans are for sale under the Affordable Care Act, but people are having trouble getting onto the website to buy it," he said. The administration has promised that the HealthCare.gov website will work well for most Americans by the end of November. Outgoing Gov. Rick Perry said Obama came to Texas to try and keep the nation's new health care law from collapsing under its own weight. The visit was a slap at Perry, a Republican who has repeatedly refused to expand health coverage under Medicaid as part of the new law. In a statement, Perry said the president was trying to "salvage his ill-conceived and unpopular program from a Titanic fate." He noted that Medicaid already consumes a quarter of the state budget, and said Texas won't accept a "one-size-fits-all Washington mandate." "Texans aren't the reason Obamacare is crumbling," Perry added. "Obamacare is the reason Obamacare is crumbling." Texas also is among the 36 states not providing their own insurance marketplaces, which means residents there must sign up through the federal website that stumbled badly upon its launch Oct. 1. Back in Washington, Health and Human Services Secretary Kathleen Sebelius faced heated questioning from senators, some of whom challenged her honesty and demanded she resign. Focusing on progress made, Sebelius said the web portal now is handling large volumes of material with fewer errors even as she acknowledged "we're not where we need to be." Obama has been aggressively promoting the law in the face of numerous setbacks. In addition to the problem-plagued enrollment launch, insurers have been sending some of their customers termination notices because their policies don't meet federal requirements. The notices have put Obama and White House officials on the defensive as they attempt to explain Obama's early vow that under the new law, people who like their existing coverage would be allowed to keep it. The Dallas Area Interfaith Coalition created bilingual booklets on the new health care law. Members have also been educating North Texas about health care options. "We're delighted he's here, and we're delighted to be a part of it," said Temple Emanu-El Senior Rabbi David Stern, who said he was honored to host the president. In Dallas County, more than 670,000 people are uninsured. At 28 percent, it is among the highest concentrations in the country. Stern said he sees the effect of it on church members who don't have health care. "We have folks who don't, folks with family members who don't," he said. "We're a multigenerational congregation with every conceivable health circumstance." Availability on the federal enrollment website Healthcare.gov has been plagued with technical problems. Texas is relying on the government site because it opted to not set up a state marketplace. "Nothing's perfect," Stern said. "The legislation is imperfect, the rollout has been troubled, but it's clear what characterizes us as Americans is the constant ambition to make life better for all of our citizens." After Obama's meeting at Temple Emanu-El, he headed to two fundraisers. He left Dallas Love Field Airport at about 9 p.m. Wednesday. NBC 5's Kendra Lyn, Omar Villafranca, Julie Fine and AP reporter Jim Kuhnhenn contributed to this report.